Are You a Conformist to Christianity? Have You Heard the True Gospel? I VISIT THE WORLD COURT LAST CHANCE FOR PEACE? A leading Protestant theologian remarked, ...,It is doubtful whether many educated Protestants today believe in "heaven" and "hell" as literal physical places. ..." "Yet to many millions hell is frighteningly real! 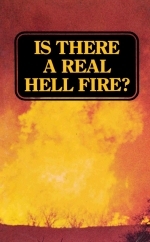 Is there a real hell, a real fire, a real torment — what does the Bible say? THE RESTAURANT was crowded with men and women discussing their day's business over lunch. Fitted in between a bank building and a hat shop, this particular restaurant was long and narrow so that many of those sitting in the rear could not see what was going on toward the entrance. About 12:30, when people were still standing in line waiting to get a table, three women walked in. Two were rather skinny, one was overly plump, all were unkempt and disheveled. About halfway to the rear of the restaurant, one of the women burst out in a loud voice screaming, "FIRE! FIRE! FIRE! Hell fire and brimstone!" Panic struck! Diners jumped to their feet, dishes clattered to the floor as patrons tried to leave through the nearest exit in response to the one word they had heard over the hubbub of conversation — "FIRE!" But the woman went on "witnessing for Christ," crudely informing all of the patrons of the restaurant they would go to hell and suffer in ever-burning flames unless they accepted Jesus Christ! While she was screaming this message at the top of her lungs, her disheveled partner bent near a patron's ear and whispered, "If you died today, would you be ready to meet Jesus?" Recovering from his shock, the manager invited these three self-styled prophetesses to leave his establishment. Things quieted down, and the hum of conversation again returned to near normal — but few were talking about business anymore. The name of Jesus Christ had been used in a very unsavory situation— people's stomachs were upset, food had been spilled on some clothing, nerves were shattered and on edge, the train of thought of those discussing business over their lunch had been forgotten. For some the whole day had been ruined! Medieval concept of hell shows doomed to writhe eternally upside down in burning potholes. This is NOT the "hell" of which the Bible speaks! But despite her crude manner of presenting it, does the hell fire this prophetess preached really exist? At the close of the 20th century, when mankind seems to have more knowledge on any given point than he has ever had in his entire history, there is more confusion, mixed-up ideas and superstitions prevailing about this burning issue of hell than ever before! God-defying atheists and narrow-minded scientists loudly proclaim they do not even believe God exists, much less a heaven or hell. On the other hand are religious people who, for sake of dogma, or because it suits their sense of justice, believe there is an ever-burning, never-consuming, torturing hell fire that awaits those who do not make a profession of their Christ. Sincere, though deceived, these individuals insist that the message from God to mankind is that if a man does not accept and love Jesus in his given span of near 70 years, the Eternal God of heaven, all-wise, all-loving, all­ merciful, will heap unimagined and excruciating pain in the ever-burning flames of hell upon that soul for all eternity— because of 70 years of sin. Many claim that this is the very power of the Gospel! That if you remove the punishment of hell, and the pains of everlasting suffering, from the good news, the Gospel message, no one would accept God's other teaching. Hell, in their good-news Gospel, becomes the place where God wreaks vengeance on "sinners." If this be true, and the governments of this earth were to follow the example of this "all-wise God" — then criminals, instead of being put in jail, or put to death, should be TORTURED! Those who claim to be God's representatives on earth, from a dignified priest to the street-corner evangelist, all demand that you choose now whether you will spend eternity in heaven or in hell! Two things are taken for granted here: one, that everyone must choose Now; and two, that eternity will be spent in hell. Where can we go to find the real truth of this matter? If there is an ever-burning, torturing hell fire that the God of heaven has in store for those who sin against Him, then certainly it behooves each of us to find out the details regarding it! Does science have the answer? Has anyone scientifically seen and examined hell, felt and smelled of hell, observed it in all of its excruciating agony and returned to tell of its existence and conditions? NO! Science does not have the answer! An encyclopedia can only give you what men have thought about hell throughout the ages of the past! The only source that talks with real authority on this subject is the Word of God! "Thy word is truth" (John 17:17). The Bible is the only source that speaks with absolute AUTHORITY on this subject — a subject beyond the realm of modern science — and yet modern science, as far as its knowledge concerning the dead goes, completely agrees with the Bible in every detail. The truth from God's own Word will agree with God's Spirit of true love, yet will certainly not detract from God's power, and will throughout its entire explanation be completely sound-minded! The overall, principal choice that God lays down for every individual is found in the much-preached but little­ understood "golden text" of the Bible, John 3:16. "For God so loved the world, that he gave his only begotten Son, that whosoever believeth in him should not perish, but have everlasting life." On the one hand God says that if you accept the sacrifice of His only begotten Son you will have everlasting life. On the other hand, if you do not accept the Savior who died for you, you must "PERISH"! How does hell enter into this? What is hell? Where is hell? Who goes to hell? How long do you stay in hell? Can you leave hell? Confusion is in the mind of today's Christian because he is told either that the Bible does not mean what it says, or that wherever "hell" is mentioned in the Bible, it is a hell of fire for the eternal torture of the damned. God's Word plainly reveals that there is more than one kind of hell. There are three different Greek words, each having a different meaning, which have been translated "hell" in the King James Version. The Greek word hades simply means "pit" or "grave." In 1611 when the King James Version was translated, the Englishmen spoke of putting their potatoes in "hell" for the winter-that is, simply in a hole in the ground! There has to be a place for those who die, and of that place we are all in common knowledge, the grave. If men immediately when they die go to either heaven or hell, then God's Word would not have said, "For David is NOT ascended into the heavens" (Acts 2:34) and, "Men and brethren, let me freely speak unto you of the patriarch David, that he IS BOTH DEAD AND BURIED, and his sepulchre is with US unto this day" (Acts 2:29). At the time Peter was preaching his first inspired sermon on that day of Pentecost in 31 A.D. — 50 days after Christ first ascended to the Father in heaven from this very "hell" — he says that the great patriarch David is still in hell! Interior shot of Herod's tomb. It is a "hell" (Greek: hades) — or HOLE in the ground. That is what the Greek word "hades" really means! "Because thou wilt not leave my [David's] soul in hell, neither wilt thou suffer thine Holy One [Jesus Christ] to see corruption" (Acts 2:27). This is quoted in your New Testament from Psalm 16:10, where David prophesied of the coming of Jesus Christ, of His crucifixion and death, of His burial and stay in the grave, "hell"-but that his stay in the grave would not be long enough for Him to suffer "corruption," that is, the decaying of the flesh. Yet after Christ was resurrected, David still remained in the grave, in his sepulchre, completely corrupted and nothing but dust at that time. By comparing this scripture with the Old Testament, we find that this hades hell of the New Testament is the same as the sheol hell of the Old Testament. God's Word describes this hell very plainly. It is merely the grave where everyone goes when he dies. It is not "the abode of the dead" in the sense that dead spirits are walking around in a dark, cold cavern somewhere in the heart of the earth, but merely the resting place where all those who have died await a resurrection. That is why the triumphant Psalm is quoted in I Corinthians 15 — the resurrection chapter­ where it states, "0 grave, where is thy victory?" (I Cor. 15:55.) All the individuals who have died and rotted and turned to dust will eventually be resurrected — some to eternal life, some to judgment. This hades hell will not have an eternal hold on those who spend time there. The description of this hell is not left to the imagination of men but very clearly defined. "Whatsoever thy hand findeth to do, do it with thy might; for there is no work, nor device, nor knowledge, nor wisdom, in the grave [sheol — hades — hell] whither thou goest" (Eccl. 9:10). Your Bible describes this as a very dead place! How else would you describe the grave? Any scientific experiment which can be enacted and observed completely backs up these Bible statements. But this is as far as science can help us. This is the only hell of which science is cognizant. Churchmen try to confuse this hades hell by admit­ ting that it is indeed the grave, but going on to explain that only the body goes to the grave while the soul goes elsewhere. This doctrine can nowhere be proved within the pages of God's Word. (Write for the free booklet Do You Have an Immortal Soul?) God 's Word very clearly says that David, not David's body, is both dead and buried and is not in heaven! And if David is not, then surely no one else is. The second Greek word translated "hell" is tartaroo. It is used only once in the Bible. "For if God spared not the angels that sinned, but cast them down to hell ..." (II Peter 2:4). The word here, very loosely translated hell, is not a place but a condition. It refers to the condition of restraint that God has imposed upon those angels which rebelled against Him and followed Satan the devil. This term — tartaroo hell — is never used in reference to man. When Satan and his demons rebelled against God, He put them in a condition of restraint — much as modern governments put criminals in a condition of restraint — where they must remain until their time of judgment (Jude 6). Science has never observed this tartaroo hell! Church­ men are confounded by it! God's truth is very plain concerning it! The Greek word gehenna denotes a place of punishment. Gehenna, or the Valley of Hinnom, is a place just outside Jerusalem where trash, filth and dead bodies were thrown to be burned up. It was a city dump and there was always a fire burning to consume the refuse that was thrown there. Jesus Christ and His disciples and apostles after Him used this word consistently when they were referring to that "hell" which will BURN UP sinners! Gehenna hell is a synonym for the lake of fire into which the unrepentant are to be cast at the end of time. This is the only hell in the Bible which is associated with flames or fire. No inner caverns in the bowels of the earth are mentioned. No ice-filled rooms where people's feet are sticking out and being tickled by demented spirits are talked about in God's Word in reference to this gehenna hell. It is never described as a fire in which the damned live, but a fire in which the damned DIE! To explain the usage of the two basic words used in the Greek language and translated "hell" in the English language in the King James Version: "And death and hell were cast into the lake of fire. This is the second DEATH. And whosoever was not found written in the book of life was cast into the lake of fire" (Rev. 20:14-15). The word translated "hell" in verse 14 is hades, the grave. The grave itself and those who are not found written in the book of life are going to be cast into the lake of fire — gehenna hell. This will empty the grave — hades hell — and it will cease to exist — no dead will ever again be buried in the grave. They will be burned up. In spite of how clearly the subject of hell is discussed in the Bible, many still quote other scriptures out of context as supposed proof that God uses hell for the purpose of inflicting never-ending torture on the damned; while others also quote still other scriptures as proof that hell is the instrument God uses to destroy the wicked, body and soul! The Garden Tomb — This is the "hell" (hades, the grave) in which Jesus was buried. Does one scripture contradict another? No! God's Word plainly says, "... Scripture cannot be broken!" (John 10:35.) How can one set of scriptures be used to "knock in the head" another set of scriptures then? The answer is, it cannot be done — honestly! It is the habit of those who quote scriptures on the subject to use only part of the verses pertaining to the subject — they read a false meaning into them. By subtle half-truths, by vivid pictures, by peddling popular — not Biblical — teachings, they shackle Christendom to unreasoning fear or insult the intelligence of the educated into complete disbelief! We must not read our inherited or desired meaning into any particular passage of scripture — "no prophecy of the scripture is of any private interpretation" (II Peter 1:20)-but each passage is interpreted by, and in the light of, other texts! Let's look into a few of the most commonly used scriptures on this subject, and understand them in the clear light of God's own Word — let's see what they really say! A startling statement is found in Mark 9:48. In this passage of Scripture, Christ spoke of a worm that "dieth not." Whoever heard of the immortality of worms? What did Christ mean? Some PEOPLE think that Jesus was referring to people as worms and was trying to say that these "people" never died — but lived on in agonizing torment. Those who say this fail to notice that Jesus does not call the wicked people "worms," but instead speaks of THEIR worm. The lexicons define the Hebrew (Isa. 66:24) and Greek (Mark 9:48) words translated "worm" as a grub or maggot, and these words in no way refer to a man. Christ was not teaching the immortality of people or worms! Actually, Jesus was here warning his listeners that those who would "offend" — who would live a life of rebellion against God — would be cast into "hell fire." Most Bibles show in the marginal rendering that this was Gehenna fire. Jesus was referring to Gehenna as a type of the second death in the "lake of fire" which will befall the ungodly. Gehenna, or the Valley of Hinnom, was located out­ side of Jerusalem and was a place where trash, filth, and the dead bodies of animals and despised criminals were thrown. If anything, especially a dead body, landed on a ledge above the fires, it would be devoured by many worms or maggots which were kept alive by the animal and vegetable substances deposited there. It was to these worms that Christ was referring when He said "their worm dieth not." But Christ didn't mean that each individual worm continued to live forever! Actually, these worms, or maggots are the larvae which develop from eggs deposited by flies. They continue for only a few days in this larval stage, then they pupate and finally emerge as flies, later dying. These are scientific facts, known by any real student of science. And yet some people think that Christ ignorantly stated that these larvae continued to live forever in that stage of development! This just goes to show that we should always be careful to use wisdom and common sense in studying God's Word. The Holy Spirit is the spirit of a sound mind (II Tim. 1:7). Let's rightly use the minds God gave us! This same reference to worms is found in Isaiah 66:24. Here we again find that the Hebrew word simply means a common grub or a maggot. These worms or larvae also feed on the dead bodies for a few days, and then emerge as flies. Thus, these worms "die not" but continue to develop into flies just as any normal, healthy worm! The flies continue to deposit their eggs only as long as there are dead bodies or other matter for the larvae to feed on. Also notice that this verse plainly says people are going to see, "look upon" — this does not take place in the center of the earth or hidden away in some hole in the ground. Startlingly, a clear and thoughtful reading of this particular verse (verse 24), shows that the verse is not talking about LIVE people, but the "CARCASES of the men that have transgressed against me." They are not alive and consciously suffering in any case! Does that mean burning forever, and never burning up? Try this test: Put a piece of paper in a pan. Light it with a match. Now, don't QUENCH that fire! Don't put it out — for that's what "quench" means. Very soon the paper will burn up. Then put it down on the floor and step on it! Now it's merely ashes under the soles of your feet — precisely as your Bible plainly says the wicked shall be! In Jeremiah 17:27, God warned the Jews that Jerusalem would be burned, and the fire would not be quenched — unless they repented. In Jeremiah 52:13, you read the account of the burning of Jerusalem. That fire was not quenched! It is not still burning! It just burned itself out. These cities of Sodom and Gomorrah suffered from the vengeance of eternal fire. Are these cities still burning and yet not being consumed? "Eternal fire" means a fire whose results are permanent or everlasting. Sodom and Gomorrah have never been rebuilt! The fires which burned Sodom and Gomorrah went out of themselves. Clearly there is no question as to the plain meaning of God's Word. All who will insist on rebel­ ling against Him unrepentantly will be burned to a crisp in a very real hell fire! Many are confused by Revelation 20:10, partly by a mistranslation, and partly because they do not let the Bible interpret the Bible. "And the devil that deceived them was cast into the lake of fire and brimstone, where the beast and the false prophet are, and shall be tormented day and night for ever and ever." In your King James Version you will notice that the word "are" is in italics. This means that the word was supplied by the translators and is not in the original Greek. This is the mistranslation that misleads, indicating that the beast and the false prophet are still in the lake of fire at the time that the devil and his demons are cast into this lake. According to the chronology of Revelation itself both the beast and the false prophet were cast alive into the lake of fire at the beginning of God's thousand-year reign on the earth (Rev. 19:20). By merely using God's J definition of what happens to human bodies when they are cast into fire, we can realize that they will be burned up just like so much fat on a hot stove (Psalm 37:20), and therefore the phrase in Revelation 20:10 should be translated "where the beast and the false prophet WERE." In Matthew 25:41 Jesus said, "Then shall he say also unto them on the left hand, Depart from me, ye cursed, into everlasting fire, prepared for the devil and his angels." Jesus here plainly showed that the everlasting fire was prepared for Satan and his angels. Yet He goes on to show that human beings who are ultimately judged unfit for eternal life, and are not granted the gift of LIFE — something they do not have of themselves — are also to be cast into this very lake of fire, as verse 46 says, "And these shall go away into everlasting punishMENT" (verse 46). This final punishment which sinners suffer is eternal DEATH by fire. It is not eternal punishiNG! Once they are burned up and now dead they are going to stay dead forever — this makes the punishment everlasting! "The Smoke of Their Torment"
Notice that verse 8 gives the time setting of Revelation 14:11. It is speaking about the impending fall of "Babylon." Verses 9 and 10 say:". .. If any man worship the beast and his image and receive his mark ... he shall be tormented with fire and brimstone . . . in the presence of the Lamb" (that is, at Christ's second coming)! Those who have a part in this system of "Babylon," and who receive this frightful punishment from Almighty God, have "no rest day nor night" as long as they remain in that land falling under God's wrath! They will either have to flee that area and seek God's mercy or be tormented by sulphurous fumes till they perish. Notice that this passage does NOT say these individuals are being tormented forever in an ever-burning hell. Verse 11 says: "... The SMOKE of their torment ascendeth up for ever and ever... ."
The Bible plainly teaches that flesh and blood is subject to combustion and death. Malachi 4:3 says the ashes of the wicked will finally be under the feet of the righteous. The wicked will be DESTROYED and will die that death — the second death-from which there is never to be a resurrection (Rev. 20:6, 14). Why Does God Use Gehenna Hell? God's plan of salvation is a 7000-year plan. For 6000 years of this time God has allowed mankind to go his way, under the influence of his own mind and directed also by the mind of Satan the devil. Man has tried every way he can think of to govern himself to bring peace, happiness, health, prosperity, but has failed miserably! Down through the ages God has selected some few whom He called out of this world to realize His plan of salvation, to repent of their ways, which are contrary to His laws, and to change their way of life to agree with God. When Jesus Christ returns to this earth, He will for the first time in mankind's history set His hand to save the whole world — that is, all people who are alive on the earth at that time. He will offer them the same salvation that He has in the past only offered to a few whom He has called out of the world. Then, at the close of a thousand years of this reign, all of those who have ever died, but never had a chance to know the true Jesus and His true Gospel message, will be resurrected and given their ONE opportunity to obey and by the strength of God's Holy Spirit to enter into His Kingdom! At one time or another every man who has ever existed will stand with his mind open and his understanding clear to live a life of overcoming with God's Spirit and endeavor to enter into His Kingdom. For further under­ standing about this point, write for our free booklet After Death — Then What? There have been, and there will be, however, some few who will utterly rebel against doing God's will — who will set their wills against obedience to His laws so completely that nothing can be done with them. These will be the individuals God refers to in His Word as those who have committed the unpardonable sin! God in His mercy has planned that these individuals should be completely done away with — made to CEASE TO EXIST! It is set down very plainly: "For the wages of sin [the transgression of God's law, living contrary to the very nature of life itself] is DEATH [the cessation of life]" (Rom. 6:23). Lest anyone should question what God meant by this, He firmly stated: "Behold, all souls are mine, as the soul of the father, so also the soul of the son is mine: THE SOUL THAT SINNETH, IT SHALL DIE" (Ezek. 18:4). God's promise to all people is life or death! Not life or life! God realizes that men are weak, that they are subject to vanity. He has not devised this lake of fire in order to torture human beings, but only to rid them once and for all from the face of the earth — to do away with their lives. Knowing that they cannot continue to live the way they want to live, but that they would only bring misery and pain and suffering on themselves throughout eternity if He allowed them to live, God mercifully puts an end to their life. And even in this act God is NOT pleased . "For I have NO PLEASURE in the death of him that dieth" (Ezek. ..18:32). God does not want anyone to be thrown into this lake of fire! But those who insist on living contrary to the laws of life are going to be mercifully snuffed from existence by this method. .
"For if we sin willfully AFTER that we have received the knowledge of the truth, there remaineth no more sacrifice for sins, but a certain FEARFUL looking for of judgment and fiery indignation, which shall DEVOUR the adversaries" (Heb. 10:26-27). Therefore we see from God's Word that hell fire is NOT held over the head of every individual to force him into accepting Jesus Christ as his personal Saviour — it is NOT a threat of pain and eternal punishing that the merciful and all-powerful Eternal God is levying against those who refuse to hear His Gospel-but a final judgment, a doing­ away-with the individuals who reject Him AFTER they have received a knowledge of His truth. The time when the real fear of a real hell fire comes on an individual is after he has sinned willfully against the knowledge of God's truth that has been opened to his mind! God Is Love — Justice! The primary reason so many men and organizations of men have a false conception of "hell" is that they view the doctrine of hell just as an isolated doctrine. They fail to look at the overall purpose of God in putting man on this earth, of offering him the gift of eternal life for obedience, or of everlasting punishment (not punishing) for disobedience. God created man in His own image and likeness (Gen. 1:26). In the Garden of Eden, He told man the way that would lead to eternal life. Then He told man that doing the wrong thing — eating of the fruit of the tree which God had forbidden — would lead to death (Gen. 2:17). But Satan, the father of lies (John 8:44), told the woman, "Ye shall not surely die" (Gen. 3:4). Man has been believing that lie — of being born with immortality within himself — ever since! God's purpose is to develop holy, righteous character in man which would make man fit for eternal life. God gave ancient Israel His commandments, "that it might be well with them, and with their children forever" (Deut. 5:29). God's decrees are always for man's good. They are not designed as arbitrary decrees which God has set in order to have some excuse for plunging men into flames of fire! Where do men get such ideas about God? Certainly not from the Bible! God created man in His own image in order that man might be brought to the place where God could entrust him with the precious gift of eternal life. Notice that God offered Adam and Eve life on one hand, and death on the other. If man would rebel against God and make it impossible for God to entrust him with eternal life — knowing that he would abuse that life — then the kindest thing that God could do would be to let man die. Then, stub­ born, sinning :rr an would be unable to bring any further misery on himself or others by his wrong ways. He would just cease to exist, and thus would not interfere with the happiness of others who were found worthy of eternal life. This is exactly what God said would happen to Adam and Eve if they disobeyed! The reward of eternal life for obedience — and of death — eternal death — for disobedience is stressed all through your Bible. Only this is consistent with the Scriptures, and with God's plan and purpose — and His character of supreme love! Yet God will not, because of His infinite love, take away anyone's life because of ignorance or weakness, but because they willfully and knowingly refuse to obey their Creator. The warning of a hell fire should be a fearful warning to those who know God's truth and still refuse to obey it! It should bring a somber realization that unless we surrender to God's will and His way of love, and refuse to let anything turn us aside, God will take away forever the life He has given us! Thousands have asked for the true explanation of the "rich man and Lazarus. , Here is what the Bible really says! Do SAVED mothers up in heaven see the writhing and hear the shrieks of their own lost children down in hell? Stop and think! Would you really want to spend eternity in a heaven where you would be forced to gaze constantly upon your own loved ones who were lost, hearing them frantically screaming to you for help you would be unable to give, gazing constantly upon their indescribable agony, as they, on fire, are burning — burning to death — yet never really burning up? Would you be happy? Yet that is exactly the kind of "heaven" that is being pictured by most of the churches and the clergy! Many of them rely more on Jesus' account of Lazarus and the rich man than any other argument to support their teaching that the "saved" go instantly, at death, to heaven while the lost leave their bodies and are plunged into an ever­ burning inferno of eternal torture. Those who deny going to heaven or to hell at the instant of death have said the account of Lazarus and the rich man was merely a parable. But the "immortal soul" advocates insist this is not a parable! Jesus was stating facts that had happened, they argue. So let's pretend this was not a parable. Let's take it literally. Jesus surely meant exactly what He said. But He did not say what is popularly believed! Also, Jesus said, "There was a certain beggar named Lazarus, which was laid at his gate, full of sores, and desiring to be fed with the crumbs which fell from the rich man's table: moreover the dogs came and licked his sores" (verses 20-21). Yes, there were many such beggars in Judaea when Jesus lived there. Next Jesus described what happened to them. "And it came to pass, that the beggar died, and was carried by the angels into Abraham's bosom: the rich man also died and was buried" (verse 22). They both died! That is exactly what Jesus said. Now read that again. Did Jesus say the beggar went to heaven? He certainly did not! He said the beggar "was carried by the angels into Abraham's bosom [at the time of the resurrection]." Did the Beggar Go to Heaven? Now what is a "bosom"? If you can find what a "bosom" is — and in this case Abraham's bosom — you will know where the beggar was taken. Look in your dictionary. A "bosom" is the breast of a human being, with the arms as an enclosure; a loving embrace by the arms of one person about another; an intimate relationship. So Lazarus was carried into an intimate relationship with Abraham. Lazarus here is pictured as a person, perhaps even a Gentile, who received salvation. Do Gentiles, upon being converted and becoming Christ's, enter into any intimate relationship to Abraham? They certainly do! To the Gentile-born Galatians, the Scriptures written by Paul say definitely: "And if ye be Christ's, then are ye Abraham's seed [children], and heirs according to the promise" (Gal. 3:29). Through Christ they become the children of Abraham. Through faith we all become "the children of Abraham" (Gal. 3:7). That is an intimate relationship with Abraham. That is being taken into Abraham's bosom! Now Abraham is an heir of God. God gave Abraham a promise. Notice (Gal. 3:29), those who through Christ become Abraham's children are heirs — but heirs according to the promise God made to Abraham. The PROMISE Was Not Heaven! Now what did God promise Abraham? To what promise was this beggar now an heir? Did God promise Abraham and his children heaven? Let's not put any interpretation upon the sacred Word of God. No scripture is of any private interpretation — it is interpreted by other scriptures. It ought not to be interpreted by man. To learn what God promised Abraham, we must turn back to Genesis 12. "And Abram took Sarai his wife ... and they went forth to go into the land of Canaan; and into the land of Canaan they came.... And the Lord appeared unto Abram, and said, Unto thy seed will I give this land" (Gen. 12:5-7). The land of Canaan is on this earth, not up in heaven. This beggar through Christ became "Abraham's seed" — in the intimate relationship of one of Abraham's children. Then God included this beggar when He said:: "Unto thy seed will I give THIS LAND. Again, later, God promised Abraham: "For all the LAND which thou seest, to thee will I give it, and to thy seed FOREVER" (Gen. 13:15). Again, still later: "In the same day the Eternal made a covenant with Abram, saying, Unto thy seed have I given this land, from the river of Egypt unto the great river, the river Euphrates" (Gen. 15:18). Here God wrote into the agreement, or the title to the property, the very boundary line of the property. Of course the expression "thy seed" refers in particular to Christ, but since this beggar was Christ's, he, also, was "Abraham's seed, and heir according to the promise." The promise was not heaven. The promise was the land of Canaan, on this earth. It was forever, so the promise included eternal life, and eternal inheritance (Heb. 9:15). The promise, then, was eternal life on this earth! Now notice an important point. The beggar was carried by the angels into Abraham's bosom — that is, by Bible explanation, he became one of Abraham 's children, and therefore he became an heir to inherit the land on this earth, and eternal life. The next question is, when was this beggar to inherit — to come into possession of eternal life in the promised land? Jesus, in telling about Lazarus and the rich man, did not cover that point. He only told what happened, not when. We must find the answer, not in human imagination or the false teaching of man, but in the Bible! The son who is heir to his father's property cannot come into possession of it before his father inherits it. This beggar, carried into the intimate relationship of a son of Abraham, could not inherit either eternal life, or this land, prior to the time his father Abraham receives these promises. When, then, did Abraham actually receive these promises? The startling answer of Scripture is-he didn't! He has not, even yet in our day, inherited these promises! Scripture reveals the answer through the inspired speech of the very first Christian martyr, Stephen, who was stoned to death for these very words. It is in Acts 7: "And he said, Men, brethren, and fathers, hearken; The God of glory appeared unto our father Abraham ... and said unto him, Get thee out of thy country, and from thy kindred, and come into the land which I shall show thee. Then came he out of the land of the Chaldeans .. .into this land, wherein ye now dwell. And He gave him none inheritance in it ... yet He promised that he would give it to him for a possession, and to his seed after him" (Acts 7:1-5). Again this amazing fact is stated in the faith chapter — Hebrews 11: "By faith Abraham, when he was called to go out into a place which he should after receive for an inheritance, obeyed.... By faith he sojourned in the LAND of promise, as in a strange country, dwelling in tabernacles with Isaac and Jacob, the heirs with him of the same promise.... These all died in faith, not having received the promises, but having seen them afar off, and were persuaded of them, and embraced them, and confessed that they were strangers and pilgrims on the earth" (Heb. 11:8-13). Abraham died, but has not to this day inherited the promises! Abraham died, and was still dead, at the time of Christ's earthly ministry. We read in John 8:52, "Abraham is dead." At that time — centuries after he died — Abraham was not living on earth or in heaven or anywhere! He is still dead today. When, then, is he to inherit the promises? At the time of the resurrection of the just, of course! The Kingdom of God is the government to be set up at Jerusalem to rule all nations after the second coming of Christ. "For the Lord Himself shall descend from heaven .. . and the dead in Christ shall rise first" (I Thes. 4:16). Human mortals, in Christ, living and dead, receive eternal life — immortality — the promises God made to Abraham — at Christ's second coming. That is when they shall put on immortality. "Flesh and blood [human mortals] cannot inherit the Kingdom of God; neither doth corruption inherit incorruption. Behold, I show you a mystery; we shall not all sleep, but we shall all be changed, in a moment, in the twinkling of an eye, at the last trump: for the trumpet shall sound, and the dead [including Abraham and the beggar] shall be raised incorruptible, and we shall be changed. For this corruptible must put on incorruption, and this mortal must put on immortality" (I Cor. 15:50-53). "When the Son of man shall come in His glory, and all the holy angels with Him," — notice, this is the second coming of Christ — "then shall He sit upon the throne of His glory .. .then" — and not until then-"shall the King say unto them on His right hand, Come, ye blessed of my Father, inherit the kingdom prepared for you from the foundation of the world" (Matt. 25:31-34). Jesus said Abraham would receive the promises, including eternal life, through the resurrection: "But as touching the resurrection of the dead, have ye not read that which was spoken unto you by God, saying, I am the God of Abraham, and the God of Isaac, and the God of Jacob? God is not the God of the dead, but of the living" (Matt. 22:31-32). Jesus did not say Abraham was then living. Yet the things God has promised are so certain they may be counted as if already accomplished. Abraham, as shown above by Scripture, was and still is dead. But Jesus spoke this about Abraham "as touching the resurrection of the dead." Abraham will be resurrected. Jesus told one particular group they would see Abraham in the Kingdom (Luke 13:28), because Abraham, now dead, will then be resurrected from the dead. Now again let's get back to what Jesus said about Lazarus in Luke. Jesus said this beggar died. So, like Abraham, he is still dead. But after Lazarus died, Jesus said he "was carried by the angels into Abraham's bosom." We now know that where he was carried was not up to heaven, but into the status of a son and heir of Abraham, to inherit the land on this earth, and eternal life upon it, at the time his father Abraham comes into his inheritance — at the time of the resurrection. But notice, Lazarus is to be carried there by the angels! When do the angels come down from heaven? In Matthew 25:31, quoted above, we saw that it was at the second coming of Christ — at the time of the resurrection. Again, Scripture reveals: Christ shall "send his angels with a great sound of a trumpet, and they shall gather together His elect from the four winds" — out of their graves in a resurrection (Matt. 24:31). The time when the angels carry Lazarus and the saints into sharing the inheritance with Abraham — into Abraham's bosom — is the time of the resurrection. Lazarus is to be resurrected, and carried by the angels through the air to meet Christ, at His return, and to be with Abraham, in the intimate relation­ ship of father and son! Yes, how plain! Lazarus will then enjoy the fond embrace of his father through Christ, Abraham — both then resurrected and living forevermore, in the promised land, then inherited! There is no doubt as to how the Bible uses the word "bosom." Turn to Isaiah 40:11. Here we find God will care for His people as a shepherd does his sheep, carrying them "in His bosom." Jesus was "in the bosom" of the Father (John 1:18), enjoying the Father's blessings and close relationship. Moses carried the children of Israel in his bosom (Num. 11:12). To be in one's bosom is to have that one's love and protection, and share his blessings and inheritance. So it will be at the resurrection. Now let's see what happened to the rich man - and when. Jesus said of him: ". . . The rich man also died, and was buried" (Luke 16:22). Jesus did not say the rich man was taken immediately at that time to an eternally burn­ ing hell. He did not say the body was buried but that the rich man himself was plunged immediately into a burning hell. He said the rich man died — and the rich man, himself, was buried. Now one would hardly say that the act of throwing one into that imaginary burning caldron luridly described as hell was a burying of the person, would he? One is not buried unless he is covered up. People are buried in a grave, and covered with earth. But the imaginary hell invented by Dante Alighieri and accepted by the Roman Catholic Church and later by most Protestants is never pictured as a place of burial. But this rich man died and was buried. He, himself, was buried — not a "house" he had lived in. Jesus said so — read it in your Bible. In the next verse, Jesus said: "And in hell he lifted up his eyes" (verse 23). So the rich man was in a place called "hell," after all, wasn't he? And in this hell he "lifted up his eyes." His eyes had been closed, in death, and now there came a time when they opened — he "lifted up his eyes." What kind of "hell" is this? Startling though it may be, the rich man was buried in the same kind of "hell" Jesus was buried in! Yes, Jesus died and was buried — and in "hell"! In the first inspired sermon preached by Peter on the day the New Testament Church started, Peter said: "He [David] seeing this before spake of the resurrection of Christ, that his soul was not left IN HELL, neither his flesh did see corruption" (Acts 2:31). Jesus, too, died and was buried. And in "hell" He, too, lifted up His eyes — when He was resurrected! Now let me explain that, and make it plain! The New Testament was written in the Greek language. Your Bible is a translation into the English language. In the English language your Bible probably reads, "And in hell he lifted up his eyes." However, in the original Greek in which the New Testament was written there are three different Greek words, each having a totally different meaning, but all three of which were translated into the King James version by the English word "hell." One of the Greek words is tartaros, which refers only to the present condition of darkness, or perversion, and of restraint, of the fallen angels, or demons. Another is gehenna, a place at the bottom of a high ledge at the south end of Jerusalem, where garbage, refuse, and bodies of the ledge to be burned up. Down below, the fires were kept continually burning. They burned up, or consumed - totally destroyed the bodies and refuse dumped there. This is the word Jesus used when He spoke of being finally destroyed in "hell fire." But this rich man was not buried in that "hell." He was not in gehenna. The third, and most commonly used Greek word was written here by Luke — hades. And hades means "the grave" — a place of burial in the ground! When the King James translation of the Bible was made, Englishmen spoke commonly of "putting their potatoes in hell for the winter." They buried them in the ground! This is the "hell" Jesus was buried in — the "hell" His soul was not left in — the grave, or tomb, from which He was resurrected! And this, hades, was also the "hell" in which the rich man was buried. WHEN Did He Open His Eyes? Now once again, Jesus did not say when this rich man, "in hell," lifted up his eyes. Jesus pictured him as one of the wicked, or lost. We must look to other scriptures to tell us when the unjust will lift up their eyes in their graves. Daniel speaks of the resurrection of the just, and of the unjust: "And many of them that sleep [their eyes closed] in the dust of the earth [their graves-buried-in hades], shall awake [lift up their eyes], some to everlasting life, and some to shame and everlasting contempt" (Dan. 12:2). Jesus said: "... The hour is coming, in the which all that are in the graves shall hear his voice, and shall come forth; they that have done good, unto the resurrection of life; and they that have done evil [including the rich man], unto the resurrection of damnation [judgment]" (John 5:28-29). Here Jesus speaks of two different, separate resurrections. Quoted above are scriptures showing that the "dead in Christ" are to be resurrected at His second coming. In I Corinthians 15:22-24, we read that all are to be resurrected — but in an order of different resurrections — Christ Himself, 1900 years ago; afterward, in a different resurrection, "they that are Christ's at his coming," and then "cometh the end" — indicating the resurrection of the unjust later. In Revelation 20:4 we read of the resurrection of those in Christ at His coming. But Revelation 20:5 says: "But the rest of the dead lived not again until the thousand years were finished." So the resurrection of the rich man and all the unjust or unsaved will take place after the millennium! It is pictured and described in Revelation 20:11-13. So, while Jesus in speaking about the rich man and Lazarus did not say when the rich man will open his eyes and be resurrected out of his grave, other scriptures do reveal that it will be after the millennium. Notice, now, Lazarus, with Abraham and all the saints who are Abraham's children, is to be resurrected at the time of Christ's coming. They shall live through the millennium. But the rest of the dead shall not live until the thousand years are past. The rich man, then, will not come back to life until a thousand years after Abraham, Lazarus, and all who are Christ's have been made alive. Will this rich man be conscious of the great lapse of time? Your Bible says, if you will believe what it says: "For the living know that they shall die: but the dead know not anything . . . for the memory of them is forgotten" (Eccl. 9:5) — that is, they have no consciousness while dead. They are totally unconscious! Job speaks of a dead man and says: "His sons come to honour, and he knoweth it not; and they are brought low, but he perceiveth it not of them" (Job 14:21). Isaiah says our father Abraham knows nothing of us, today (Isa. 63:16). David was inspired to write: "His breath goeth forth, he returneth to his earth; m that very day his thoughts perish" (Psalm 146:4). Many times people have died, and by the drug adrenalin or other methods the heart has been started beating again. Always they say they were totally unconscious — no dreams — no knowledge — just a total blank. The rich man, then, at the time of his resurrection, after the millennium, will come to consciousness, open and lift up his eyes, knowing absolutely nothing of the hours, days, and years since he died. To him it will be the next fraction of a second from the time — he died. It will seem to him as if he had gone immediately to this state or condition in which he finds himself rising up out of the grave. But when he is resurrected, he sees a flame which torments him. What is this? Now Jesus did, on other occasions, speak of perishing and being destroyed in gehenna fire. What is this? It is described in Revelation 20:14-15, as a lake of fire. Scripture everywhere describes the final fate of the wicked as being burned up. Their punishment is death by fire! It is this "lake of fire," which is "the second death," from which there shall be no resurrection! They remain forever dead! This death is for all eternity — eternal punishment — but it is not eternal punishing! Now, opening his eyes in his grave, this rich man SEES Abraham, and Lazarus in his "bosom" — his embrace! He also sees this awful flame of fire — this lake of fire which is about to destroy him forever! He is terrified! What happens when one is suddenly so horrified with fear? His mouth goes dry. His tongue sticks to his mouth and throat! The rich man cries out in this mental agony: "Father Abraham, have mercy on me, and send Lazarus, that he may dip the tip of his finger in water, and cool my TONGUE; for I am tormented in this flame." Now if the rich man were in the kind of "hell" most people seem to believe, his whole body would be on fire — you would think he would have called for at least a bucket of water to put out the fire, wouldn't you? How much water did he call for? He said to Abraham: ".. . Send Lazarus, that he may dip the tip of his finger in water." Just a couple of drops — that's all the water he requested! Doesn't that strike you as strange? Why did he call for water? To put out the fires of all "hell"? — the kind of hell people would have you believe he was in? Ah, no! He only wanted a mere couple of drops of water on Lazarus' finger — why? — "to 'cooL MY TONGUE'!" That's what the rich man said! Open your own Bible again, and read it! The flame, he said, was "tormenting" him. This word "tormented," used in verses 24 and 25 is translated from the Greek word odunomai. This is defined in any Greek­ English lexicon as "to cause pain, to pain, distress; pain of body, but also, pain of mind; grief, distress." Why, of course! This rich man opens his eyes in his grave in a resurrection. He is resurrected mortal, just as he was before he died — not immortal like Lazarus. He sees this lake of fire. Now he knows the frightful, the awful doom he is to be thrust into — to be burned up — destroyed! He is suffering mental anguish such as he never experienced in his lifetime. His tongue is dry. He breaks out in cold sweat. He cries for a little water on the tip of Lazarus' finger to cool his tongue! He is in a condition of weeping and gnashing of teeth! Now once again read this in your Bible. Read exactly what Jesus said, not what the "hell-fire" preachers have told you He said! Did Jesus say this rich man was going to suffer endlessly and forever — always burning — being on fire — yet never burning up? Did He? Of course not! There is not one word here about how long his anguish is to last. Jesus was saying these things to those who would not repent. What did He want to make them understand, when He gave this account about Lazarus and the rich man? Jesus answers this question for us in Luke 13:27, 28 where He said: "Depart from me, all ye workers of iniquity. There shall be weeping and gnashing of teeth, when ye shall see Abraham, and Isaac, and Jacob, and all the prophets, in the Kingdom of God, and you yourselves thrust out." Yes, they are going to be in exactly the same position as this rich man! Jesus is using him as an illustration to show these individuals what is to befall them. They are to be thrust out — into the lake of fire which shall consume them, leaving them neither root nor branch, as the Scriptures say. The wicked are going to be cast into the lake of fire. When they lift up their eyes in their resurrection, they shall know that they are doomed, now to be cast into the lake of fire to be burned up. This rich man cried out for help because of his mental and physical anguish — knowing what was now to befall him! He knew he was guilty! When a man realizes he is guilty, and faces his just and terrible retribution, the very first part of the body to be affected is the tongue, which dries out — seems to be on fire. But Abraham and Lazarus were afar off, and no water was brought. The rich man had to suffer mentally for his sins. He had had his reward, in the material things he sought and craved, during his mortal lifetime. There is a great gulf fixed between this doomed sinner and all the glorified saints in God's Kingdom. What is that great gulf? The gulf mentioned by Abraham which prevents the wicked from escaping death by hell-fire, and which also keeps the righteous from being burned, is immortality. Those who are immortal shall never die because they are born of God (Rev. 20:6). But human beings who have not been begotten and born by the Spirit of God are still flesh, subject to corruption and death. They can be burned by fire. Don't forget, this is a literal fire and the rich man is a human being composed of flesh and blood. Only the saved possess immortality as the gift of God (Rom. 2:7), but the wicked reap anguish and wrath that shall devour the adversary — fiery indignation (Heb. 10:27). What happens when a human body is being burned by a flame? There is a period of torture during which the fire consumes the body before the person dies. Then what about this rich man? Jesus didn't say he was immortal, for if he were he would be spirit and flames do not burn spirit. Fire is a physical process. It is combustion of matter. The rich man is a physical person just as you are. And Jesus leaves us in this account, with the rich man hearing the words of Abraham in his mind or conscience and tormented by the flames that are billowing about his body. A human body doesn't burn forever. It finally turns to ashes in a fire. Therefore we must go to other verses of the Bible to find out exactly what did happen after the short conversation recorded. Matthew 13:30 speaks of the wicked being gathered into bundles to be burned. What happens to tares (weeds) when in fire? They burn up! Again in Matthew 3:12, John warned the Pharisees that they would be burned up as chaff if they didn't repent. They are to be burned with unquenchable fire, too. A fire so hot that no amount of water put on it could put it out, because the flames would turn the water to steam. When God punishes the wicked the fire will be unquenchable! But that doesn't say it won't burn itself out when it has nothing more to burn. An unquenchable fire can't be put out, but it can burn itself out when it has consumed everything. Malachi 4:1, 3 speaks of this fire that will burn the rich man: "For, behold, the day cometh, that shall burn as an oven; and all the proud, yea, and all that do wickedly, shall be stubble: and the day that cometh shall burn them up, saith the Lord of hosts, that it shall leave them neither root nor branch.... And ye shall tread down the wicked; for they shall be ashes under the soles of your feet in the day that I shall do this." That is the end of the wicked! They shall perish and not be any more. "Into smoke shall they consume away" (Psalm 37:20). The rich man then, being mortal flesh, is going to burn up after being tormented in the flame. He is going to die the second death (Rev. 20:14). The wages of sin is death, not endless torment (Rom. 6:23). The rich man at last realized he was doomed! He now comprehended the gulf that existed between him and those who had been made immortal. Abraham had made clear the utter impossibility of the rich man crossing that gulf into immortality. He had had his chance during his lifetime. He had passed it up for this world's material riches and pleasures. There was no hope for him. He was now doomed to perish in this lake of fire. His last thought flashed finally to his five brothers. He gave one last cry to Abraham, begging him to send Lazarus to his father's house to plead with his brothers, lest they come to his terrible fate. Abraham replied they had the writings of Moses and the prophets. But the rich man realized they would not hear these scriptures. The rich man knew Lazarus was raised from the dead! This one statement proves that the whole experience of Lazarus and the rich man was given by Jesus to show the truth of the resurrection — not to teach any immediate going to "heaven" or "hell" at the instant of death. Abraham replied: "If they hear not Moses and the prophets, neither will they be persuaded, though one ROSE from the dead" (verse 31). There it is! In plain language! The experience of Lazarus and the rich man shows the resurrection from the dead — not an instantaneous going to "heaven" or "hell." It is a resurrection from the dead — not from life. It shows mortality which dies, and is dead — not immortality which never loses consciousness and lives forever in an eternal punishing of the imaginary "hell." Jesus was showing a resurrection — or bringing back to life of one who was dead — of one who had no consciousness whatever of the lapse of centuries and millennia since his death. Far from illustrating immortality of the soul and the lurid eternally burning torture of Dante's fabled "hell," Jesus illustrates death — total unconsciousness through the centuries — resurrection from death and restoration of consciousness — and, finally, the second death in the lake of fire that shall totally destroy the wicked — in which they perish — and become ashes under the soles of the feet of the saved — the eternal punishment of death — eternal death — the SECOND death! Finally, what is the real lesson? Jesus was preaching the Gospel of the Kingdom of God — the New Testament Gospel. He was showing salvation, the resurrection to eternal LIFE as the gift of God — inheritance of the Kingdom of God on this earth. The Apostle Paul plainly tells us that the New Testament Church of God is built upon the foundation of the apostles and the prophets, Jesus Christ being the chief corner stone (Eph. 2:20). Jesus said: "I . will build my Church." Paul reveals it was built on the foundation of the PROPHETS as well as the apostles! Jesus here teaches YOU that if you refuse to hear Moses and the prophets — and Moses was one of the prophets — you have no hope of salvation! The scriptures (Old Testament as well as New), according to II Timothy 3:15, are able to make us wise unto salvation. We are to take the whole Bible, not the New Testament only. Those who teach that the Commandments of God are done away teach a message of doom! Those who teach the pagan doctrine of the immortality of the soul — going off to "heaven" at death, or eternal punishing — teach contrary to what Jesus said! May you take heed, and hear all the Word of God!